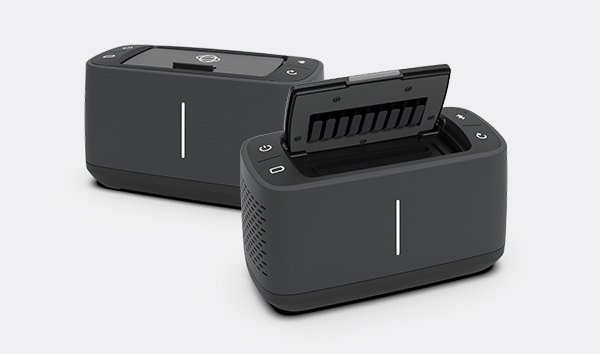 This week we are proud to launch our brand new mobile PCR thermocycler – Franklin™ by Biomeme. Franklin enables multiplex real-time detection of up to 27 targets from a single sample. It’s 3 lbs, hand-held, and battery-operated for maximum portability providing you with a full day’s work out in the field on a single charge. Franklin™ comes in three different variations depending on the color channel detection you require – one9, two9 and three9. These variations give you the freedom to start small with a 1-color (Green, FAM/SYBR), 9-well portable thermocycler, but also the ability to add up to two additional color channels (Amber, TexasRedX & Red, ATTO647N) in a matter of minutes. The remote upgrade is simple and handled over-the-air via our companion mobile app, Biomeme Go.